The unique SSL δelta-Control (δ-Ctrl) console automation system unites the very best of automation in the analogue console domain with DAW based workflow. The δelta-Control (δ-Ctrl) Single Fader Plug-in is a native AAX/AU/VST/VST3 plug-in that allows automation of AWS channel and mix bus volume as if it were a DAW plug-in. Inserting 24 instances into the DAW session will allow control of volumes and cuts for all 24 AWS channels. The automation system in the DAW is used to record and playback AWS volume control data entered either directly from the console faders or from the fader in the plug-in GUI. 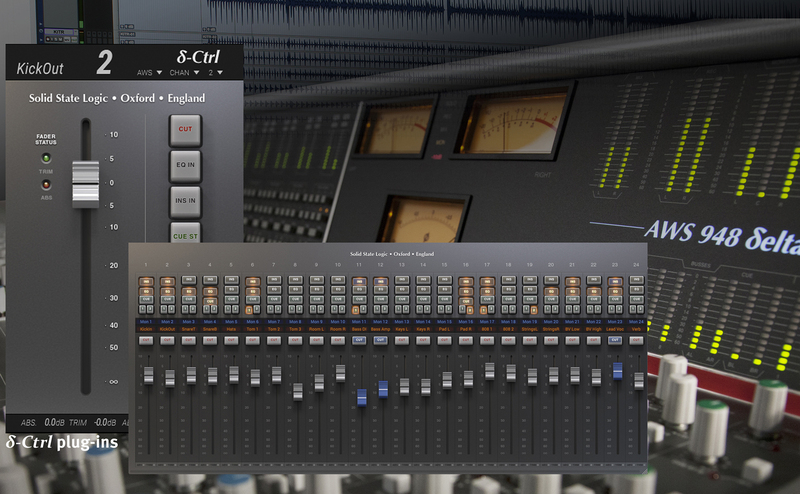 The δ-Ctrl plug-in is inserted into a DAW mixer audio or aux channel. The plug-in then receives and sends volume data from the AWS via a high speed ethernet network connection. Audio on the DAW track passes through the plug-in slot unprocessed so the plug-in can be combined with other DAW plug-ins. AWS’ Volume and Mute switch are represented as plug-in parameters in the δ-Ctrl plug-in GUI and their automation data is recorded to the automation lane of the selected DAW channel. In playback, the plug-in converts the stored automation data from the DAW into δ-Ctrl messages and routes these back to the AWS via the network connection. The introduction of the δelta-Control 24 Channel Plug-in brings compatibility to Logic users whilst also offering alternative workflow options to users of other DAWs. From one plug-in GUI, all AWS channel features can be automated including: Fader levels, Cuts and Insert Points for both channel and monitor paths (Absolute and Trim) In addition to this EQ, Cue, and FX switches for every channel can also be automated.